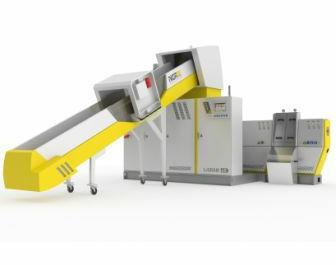 Next Generation Recyclingmaschinen GmbH, Feldkirchen a.d. Donau – leading Austrian manufacturer of plastics recycling machinery has re-engineered its S:GRAN series for the re-pelletizing of technical- and thermoplastics. The recycling lines are now even more energy efficient as well as user friendly. The reworked design language of the highly versatile S:GRAN recycling machine is intended to reflect its innovative strength, high efficiency and ease of operation. However, an improved external appearance was not the only objective of recent re-engineering. Indeed, numerous aspects of the most successful machine series from NGR-Recyclingmaschinen GmbH have been subjected to what is partly considerable upgrading. Apart from a modernized appearance, the focus was also on still better user-friendliness, enhanced process stability, increased performance and energy efficiency. Accordingly, in line with the “Power Intelligence” concept, the efficiency of the drive train has been raised by the utilization of frequency inverters as a standard feature, the electrical switching cubicle has been fitted with air conditioning and the shredder knife redesigned in order to allow its multiple use. Moreover, reduced standstills and thus increased machine availability have been attained through the systematic use of greater machine component accessibility, which facilitates servicing and cleaning.